For a book to be a must read, it needs to have a few things going for it. A good plot, believable dialogue and perhaps most importantly, have characters a reader can relate to in some capacity. To me that doesn’t mean a character you 100% agree with or sympathize with, instead I mean a character that in some manner you ‘get”. Maybe a character who regrets the choices they made that pushed a former lover away or a character who aches for more time with their child. Sometimes it is a character who longs to do something in life that reminds them despite all the poor choices they make thy can find some semblance of salvation. 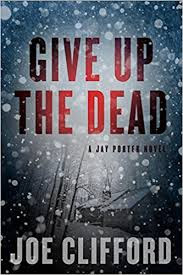 If you find yourself agreeing with my sentiments, then Joe Clifford’s new Jay Porter book, Give Up The Dead, is going to end up on your must read list. Porter is a brooding, pessimistic jerk in many instances. He dwells on past mistakes, not just his own, but the mistakes and injustices he views others have made against him. He beats himself up over choices he has made and allows these negative emotions impact the life he lives. An ex-wife and a child he barely sees are the main baggage he carries, but the guilt over his brothers lost life weigh on his soul as well. Porter is deeply flawed character, but that is the strength of this series. He is the typical “everyman”. He fights the fight, even when the fight is lost from the start. Every reader will connect with him in some capacity. Porter finds himself reluctantly, drawn into a messy divorce of a wealthy couple and the search for their missing teenage son. Porter is unsure of what the motivations of many of the people involved in these divorce, but he does know he wants to help keep the boy safe. The more he digs into the whereabouts of the son, the deeper he falls into a world he isn’t quite prepared to deal with. Add in a traumatic brain injury to his father figure, his quiet obsession with a married woman, and his best friend learning he is slowly killing himself through drink and you have a story that forces Porter to make hard choices at every turn. With an ending which adds a new layer of guilt to Porter’s psyche, there is sure to be an addition to the series; good news for Clifford fans such as myself. Clifford has a knack for being able to dive into Porter’s psyche and show his emotions and frustrations in an easily relatable manner. I am really digging this series.